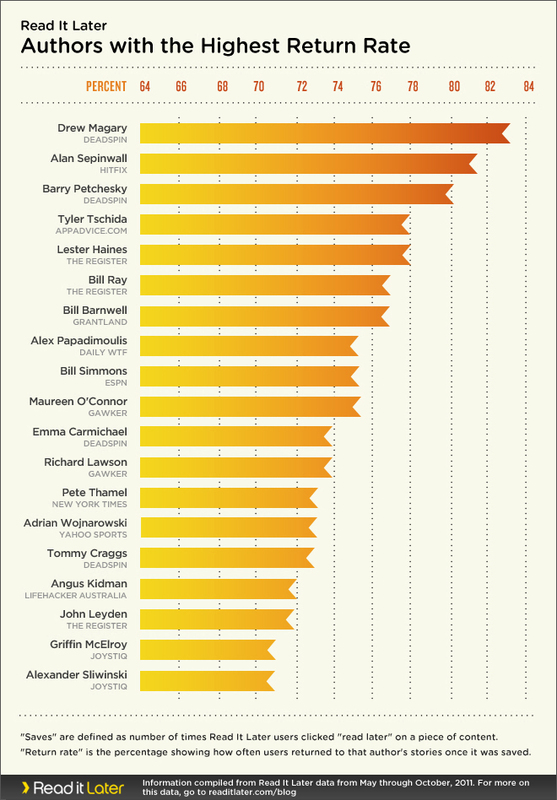 Who Are The “Most-Read” Authors on the Internet? Read It Later has a unique dataset to explore these kinds of questions. Nearly 4 million users rely on Read It Later when they click the “read later” in their browser, tablet or smartphone—and they come back to our app to dig deeper into the stories they’ve saved, recipes they’ve discovered, or videos their friends have recommended. That means Read It Later users aren’t just drive-by visitors to a piece of content—they’re passionate about it. The content is important enough that they added it to their queue so they wouldn’t miss it. Overall, though, this provides an interesting view on who and what people are reading, and what types of content are most popular on these types of services. The above chart shows authors who have the highest “rate of return,” where people actually returned to check on their stories repeatedly. No surprise: previous /Filmcast guest Alan Sepinwall, an erudite, articulate, insightful television writer, scores right near the top.